Polonium is a chemical element with symbol Po and atomic number 84. A rare and highly radioactive metal with no stable isotopes, polonium is chemically similar to selenium and tellurium, though it also shows resemblances to its horizontal neighbors thallium, lead, and bismuth due to its metallic character. Due to the short half-life of all its isotopes, its natural occurrence is limited to tiny traces of the fleeting polonium-210 (with a half-life of 138 days) in uranium ores, as it is the penultimate daughter of natural uranium-238. Though slightly longer-lived isotopes exist, they are much more difficult to produce. Today, polonium is more often produced in milligram quantities by the neutron irradiation of bismuth. Due to its intense radioactivity, which results in radiolysis of chemical bonds and immense radioactive self-heating, its chemistry has mostly been investigated on the trace scale only. Polonium was discovered in 1898 by Marie and Pierre Curie, when it was chemically separated out of uranium ore and identified solely by its strong radioactivity: it was the first element to be so discovered. It was named after Marie Curie's homeland of Poland. Applications of polonium are sparse and dependent on its radioactivity: they include heaters in space probes, antistatic devices, and sources of neutrons and alpha particles. Its intense radioactivity makes it dangerously toxic to life. Polonium has 33 known isotopes, all of which are radioactive. They have atomic masses that range from 188 to 220 u. 210Po (half-life 138.376 days) is the most widely available. The longer-lived 209Po (half-life 125.2 ± 3.3 years, longest-lived of all polonium isotopes) and 208Po (half-life 2.9 years) can be made through the alpha, proton, or deuteron bombardment of lead or bismuth in a cyclotron. Polonium is a radioactive element that exists in two metallic allotropes. The alpha form is the only known example of a simple cubic crystal structure in a single atom basis, with an edge length of 335.2 picometers; the beta form is rhombohedral. The structure of polonium has been characterized by X-ray diffraction and electron diffraction. The chemistry of polonium is similar to that of tellurium, although it also shows some similarities to its neighbor bismuth due to its metallic character. Polonium dissolves readily in dilute acids, but is only slightly soluble in alkalis. Polonium solutions are first colored in pink by the Po2+ ions, but then rapidly become yellow because alpha radiation from polonium ionizes the solvent and converts Po2+ into Po4+. This process is accompanied by bubbling and emission of heat and light by glassware due to the absorbed alpha particles; as a result, polonium solutions are volatile and will evaporate within days unless sealed. 2) is a volatile liquid at room temperature prone to dissociation; it is thermally unstable. Water is the only other known hydrogen chalcogenide which is a liquid at room temperature; however this is due to hydrogen bonding. The two oxides PoO2 and PoO3 are the products of oxidation of polonium. Also tentatively called "radium F", polonium was discovered by Marie and Pierre Curie in 1898, and was named after Marie Curie's native land of Poland (Latin: Polonia). Poland at the time was under Russian, German, and Austro-Hungarian partition, and did not exist as an independent country. It was Curie's hope that naming the element after her native land would publicize its lack of independence. Polonium may be the first element named to highlight a political controversy. This element was the first one discovered by the Curies while they were investigating the cause of pitchblende radioactivity. Pitchblende, after removal of the radioactive elements uranium and thorium, was more radioactive than the uranium and thorium combined. This spurred the Curies to search for additional radioactive elements. They first separated out polonium from pitchblende in July 1898, and five months later, also isolated radium. Because it is present in such small concentrations, isolation of polonium from natural sources is a very tedious process. The largest batch of the element ever extracted, performed in the first half of the 20th century, contained only 40 Ci (1.5 TBq) (9 mg) of polonium-210 and was obtained by processing 37 tonnes of residues from radium production. Polonium is now obtained by irradiating bismuth with high-energy neutrons or protons. The longer-lived isotopes of polonium, 208Po and 209Po, can be formed by proton or deuteron bombardment of bismuth using a cyclotron. Other more proton-rich and more unstable isotopes can be formed by the irradiation of platinum with carbon nuclei. Because of intense alpha radiation, a one-gram sample of 210Po will spontaneously heat up to above 500 °C (932 °F) generating about 140 watts of power. Therefore, 210Po is used as an atomic heat source to power radioisotope thermoelectric generators via thermoelectric materials. For instance, 210Po heat sources were used in the Lunokhod 1 (1970) and Lunokhod 2 (1973) Moon rovers to keep their internal components warm during the lunar nights, as well as the Kosmos 84 and 90 satellites (1965). The alpha particles emitted by polonium can be converted to neutrons using beryllium oxide, at a rate of 93 neutrons per million alpha particles. Thus Po-BeO mixtures or alloys are used as a neutron source, for example in a neutron trigger or initiator for nuclear weapons and for inspections of oil wells. About 1500 sources of this type, with an individual activity of 1,850 Ci (68 TBq), have been used annually in the Soviet Union. Polonium was also part of brushes or more complex tools that eliminate static charges in photographic plates, textile mills, paper rolls, sheet plastics, and on substrates (such as automotive) prior to the application of coatings. Alpha particles emitted by polonium ionize air molecules that neutralize charges on the nearby surfaces. Some anti-static brushes contain up to 500 microcuries (20 MBq) of 210Po as a source of charged particles for neutralizing static electricity. In USA, the devices with no more than 500 µCi (19 MBq) of (sealed) 210Po per unit can be bought in any amount under a "general license", which means that a buyer need not be registered by any authorities. Polonium needs to be replaced in these devices nearly every year because of its short half-life; it is also highly radioactive and therefore has been mostly replaced by less dangerous beta particle sources. Tiny amounts of 210Po are sometimes used in the laboratory and for teaching purposes—typically of the order of 4–40 kBq (0.11–1.08 µCi), in the form of sealed sources, with the polonium deposited on a substrate or in a resin or polymer matrix—are often exempt from licensing by the NRC and similar authorities as they are not considered hazardous. Small amounts of 210Po are manufactured for sale to the public in the United States as 'needle sources' for laboratory experimentation, and are retailed by scientific supply companies. The polonium is a layer of plating which in turn is plated with a material such as gold, which allows the alpha radiation (used in experiments such as cloud chambers) to pass while preventing the polonium from being released and presenting a toxic hazard. According to United Nuclear, they typically sell between four and eight such sources per year. Polonium is highly dangerous and has no biological role. By mass, polonium-210 is around 250,000 times more toxic than hydrogen cyanide (the LD50 for 210Po is less than 1 microgram for an average adult (see below) compared with about 250 milligrams for hydrogen cyanide). The main hazard is its intense radioactivity (as an alpha emitter), which makes it very difficult to handle safely. Even in microgram amounts, handling 210Po is extremely dangerous, requiring specialized equipment (a negative pressure alpha glove box equipped with high performance filters), adequate monitoring, and strict handling procedures to avoid any contamination. Alpha particles emitted by polonium will damage organic tissue easily if polonium is ingested, inhaled, or absorbed, although they do not penetrate the epidermis and hence are not hazardous as long as the alpha particles remain outside the body. Wearing chemically resistant and intact gloves is a mandatory precaution to avoid transcutaneous diffusion of polonium directly through the skin. Polonium delivered in concentrated nitric acid can easily diffuse through inadequate gloves (e.g., latex gloves) or the acid may damage the gloves. It has been reported that some microbes can methylate polonium by the action of methylcobalamin. This is similar to the way in which mercury, selenium and tellurium are methylated in living things to create organometallic compounds. Studies investigating the metabolism of polonium-210 in rats have shown that only 0.002 to 0.009% of polonium-210 ingested is excreted as volatile polonium-210. The median lethal dose (LD50) for acute radiation exposure is generally about 4.5 Sv. The committed effective dose equivalent 210Po is 0.51 µSv/Bq if ingested, and 2.5 µSv/Bq if inhaled. So a fatal 4.5 Sv dose can be caused by ingesting 8.8 MBq (240 µCi), about 50 nanograms (ng), or inhaling 1.8 MBq (49 µCi), about 10 ng. One gram of 210Po could thus in theory poison 20 million people of whom 10 million would die. The actual toxicity of 210Po is lower than these estimates, because radiation exposure that is spread out over several weeks (the biological half-life of polonium in humans is 30 to 50 days) is somewhat less damaging than an instantaneous dose. It has been estimated that a median lethal dose of 210Po is 15 megabecquerels (0.41 mCi), or 0.089 micrograms, still an extremely small amount. For comparison, one grain of table salt is about 0.06 mg = 60 μg. Polonium was administered to humans for experimental purposes from 1943 to 1947; it was injected into four hospitalised patients, and orally given to a fifth. Studies such as this were funded by the Manhattan Project and the AEC, and conducted at the University of Rochester. The objective was to obtain data on human excretion of polonium to correlate with more extensive data from rats. Patients selected as subjects were chosen because experimenters wanted persons who had not been exposed to polonium either through work or accident. All subjects had incurable diseases. Excretion of polonium was followed, and an autopsy was conducted at that time on the deceased patient to determine which organs absorbed the polonium. Patients' ages ranged from 'early thirties' to 'early forties.' The experiments were described in Chapter 3 of Biological Studies with Polonium, Radium, and Plutonium, National Nuclear Energy Series, Volume VI-3, McGraw-Hill, New York, 1950. Not specified is the isotope under study, but at the time polonium-210 was the most readily available polonium isotope. The DoE factsheet submitted for this experiment reported no follow up on these subjects. The cause of death in the 2006 murder of the Russian KGB agent who defected to the British MI6 intelligence agency, Alexander Litvinenko was determined to be 210Po poisoning. According to Prof. Nick Priest of Middlesex University, an environmental toxicologist and radiation expert, speaking on Sky News on December 3, 2006, Litvinenko was probably the first person to die of the acute α-radiation effects of 210Po. Abnormally high concentrations of 210Po were detected in July 2012 in clothes and personal belongings of the Palestinian leader Yasser Arafat, a heavy smoker, who died on 11 November 2004 of uncertain causes. The spokesman for the Institut de Radiophysique in Lausanne, Switzerland, where those items were analyzed, stressed that the "clinical symptoms described in Arafat's medical reports were not consistent with polonium-210 and that conclusions could not be drawn as to whether the Palestinian leader was poisoned or not", and that "the only way to confirm the findings would be to exhume Arafat's body to test it for polonium-210". On 27 November 2012 Arafat's body was exhumed and samples were taken for separate analysis by experts from France, Switzerland and Russia. On 12 October 2013, The Lancet published the group's finding that high levels of the element were found in Arafat's blood, urine, and in saliva stains on his clothes and toothbrush. The French tests later found some polonium but stated it was from "natural environmental origin". Following later Russian tests, Vladimir Uiba, the head of the Russian Federal Medical and Biological Agency, stated in December 2013 that Arafat died of natural causes, and they had no plans to conduct further tests. Polonium-210 is widespread in the biosphere, including in human tissues, because of its position in the uranium-238 decay chain. Natural uranium-238 in the Earth's crust decays through a series of solid radioactive intermediates including radium-226 to the radioactive gas radon-222, some of which, during its 3.8-day half-life, diffuses into the atmosphere. There it decays through several more steps to polonium-210, much of which, during its 138-day half-life, is washed back down to the Earth's surface, thus entering the biosphere, before finally decaying to stable lead-206. As early as the 1920s Antoine Lacassagne, using polonium provided by his colleague Marie Curie, showed that the element has a very specific pattern of uptake in rabbit tissues, with high concentrations particularly in liver, kidney and testes. More recent evidence suggests that this behavior results from polonium substituting for sulfur in sulfur-containing amino-acids or related molecules and that similar patterns of distribution occur in human tissues. Polonium is indeed an element naturally present in all humans, contributing appreciably to natural background dose, with wide geographical and cultural variations, and particularly high levels in arctic residents, for example. 1 2 Thayer, John S. (2010). "Relativistic Effects and the Chemistry of the Heavier Main Group Elements": 78. doi:10.1007/978-1-4020-9975-5_2. 1 2 Boutin, Chad. "Polonium's Most Stable Isotope Gets Revised Half-Life Measurement". nist.gov. NIST Tech Beat. Retrieved 9 September 2014. 1 2 3 "Polonium" (PDF). Argonne National Laboratory. Archived from the original (PDF) on 2007-07-03. Retrieved 2009-05-05. ↑ "210PO α decay". Nuclear Data Center, Korea Atomic Energy Research Institute. 2000. Retrieved 2009-05-05. ↑ Desando, R. J.; Lange, R. C. (1966). "The structures of polonium and its compounds—I α and β polonium metal". Journal of Inorganic and Nuclear Chemistry. 28 (9): 1837–1846. doi:10.1016/0022-1902(66)80270-1. 1 2 3 4 5 6 Emsley, John (2001). Nature's Building Blocks. New York: Oxford University Press. pp. 330–332. ISBN 0-19-850341-5. ↑ Weigel, F. (1959). "Chemie des Poloniums". Angewandte Chemie. 71 (9): 289–316. doi:10.1002/ange.19590710902. ↑ Bagnall, K. W.; d'Eye, R. W. M. (1954). "The Preparation of Polonium Metal and Polonium Dioxide". J. Chem. Soc: 4295–4299. doi:10.1039/JR9540004295. 1 2 Bagnall, K. W.; d'Eye, R. W. M.; Freeman, J. H. (1955). "The polonium halides. Part I. Polonium chlorides". Journal of the Chemical Society (Resumed): 2320. doi:10.1039/JR9550002320. 1 2 Bagnall, K. W.; d'Eye, R. W. M.; Freeman, J. H. (1955). 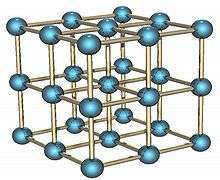 "The polonium halides. Part II. Bromides". Journal of the Chemical Society (Resumed): 3959. doi:10.1039/JR9550003959. ↑ Bagnall, K. W.; d'Eye, R. W. M.; Freeman, J. H. (1956). "657. The polonium halides. Part III. Polonium tetraiodide". Journal of the Chemical Society (Resumed): 3385. doi:10.1039/JR9560003385. 1 2 Curie, P.; Curie, M. (1898). "Sur une substance nouvelle radio-active, contenue dans la pechblende" [On a new radioactive substance contained in pitchblende] (PDF). Comptes rendus (in French). 127: 175–178. Archived from the original on July 23, 2013. CS1 maint: Unfit url (link) English translation. ↑ Pfützner, M. (1999). "Borders of the Nuclear World – 100 Years After Discovery of Polonium". Acta Physica Polonica B. 30: 1197. Bibcode:1999AcPPB..30.1197P. ↑ Adloff, J. P. (2003). "The centennial of the 1903 Nobel Prize for physics". Radichimica Acta. 91 (12–2003): 681–688. doi:10.1524/ract.91.12.681.23428. 1 2 Kabzinska, K. (1998). "Chemical and Polish aspects of polonium and radium discovery". Przemysl Chemiczny. 77 (3): 104–107. 1 2 Nuclear Weapons FAQ, Section 4.1, Version 2.04: 20 February 1999. Nuclearweaponarchive.org. Retrieved on 2013-04-28. ↑ Moss, William and Eckhardt, Roger (1995) "The Human Plutonium Injection Experiments", Los Alamos Science, Number 23. ↑ Kilthau, Gustave F (1996). "Cancer risk in relation to radioactivity in tobacco". Radiologic Technology. 67 (3): 217–222. PMID 8850254. ↑ "Alpha Radioactivity (210 Polonium) and Tobacco Smoke". Archived from the original on June 9, 2013. Retrieved 2009-05-05. 1 2 3 Monique, E. Muggli; Ebbert, Jon O.; Robertson, Channing; Hurt, Richard D. (2008). "Waking a Sleeping Giant: The Tobacco Industry's Response to the Polonium-210 Issue". American Journal of Public Health. 98 (9): 1643–50. doi:10.2105/AJPH.2007.130963. PMC 2509609 . PMID 18633078. ↑ Adloff, J. P. & MacCordick, H. J. (1995). "The Dawn of Radiochemistry". Radiochimica Acta. 70/71: 13–22. doi:10.1524/ract.1995.7071.special-issue.13. , reprinted in Adloff, J.P (1996). One hundred years after the discovery of radioactivity. p. 17. ISBN 978-3-486-64252-0. ↑ Schulz, Wallace W.; Schiefelbein, Gary F.; Bruns, Lester E. (1969). "Pyrochemical Extraction of Polonium from Irradiated Bismuth Metal". Ind. Eng. Chem. Process Des. Dev. 8 (4): 508–515. doi:10.1021/i260032a013. ↑ "Q&A: Polonium-210". RSC Chemistry World. 2006-11-27. Retrieved 2009-01-12. ↑ "Most Polonium Made Near the Volga River". The St. Petersburg Times – News. 2001-01-23. ↑ Usanov, V. I.; Pankratov, D. V.; Popov, É. P.; Markelov, P. I.; Ryabaya, L. D.; Zabrodskaya, S. V. (1999). "Long-lived radionuclides of sodium, lead-bismuth, and lead coolants in fast-neutron reactors". Atomic Energy. 87 (3): 658–662. doi:10.1007/BF02673579. ↑ Naumov, V. V. (November 2006). За какими корабельными реакторами будущее?. Атомная стратегия (in Russian). 26. ↑ Atterling, H.; Forsling, W. (1959). "Light Polonium Isotopes from Carbon Ion Bombardments of Platinum". Arkiv för Fysik. 15 (1): 81–88. OSTI 4238755. ↑ Hanslmeier, Arnold (2002). The sun and space weather. Springer. p. 183. ISBN 1-4020-0684-5. ↑ Wilson, Andrew (1987). Solar System Log. London: Jane's Publishing Company Ltd. p. 64. ISBN 0-7106-0444-0. ↑ Rhodes, Richard (2002). Dark Sun: The Making of the Hydrogen Bomb. New York: Walker & Company. pp. 187–188. ISBN 0-684-80400-X. ↑ Boice, John D.; Cohen, Sarah S.; et al. (2014). "Mortality Among Mound Workers Exposed to Polonium-210 and Other Sources of Radiation, 1944–1979". Radiation Research. 181 (2): 140214120928006. doi:10.1667/RR13395.1. ISSN 0033-7587. ↑ "Static Control for Electronic Balance Systems" (PDF). Archived from the original (PDF) on November 10, 2013. Retrieved 2009-05-05. ↑ "BBC News : College breaches radioactive regulations". 2002-03-12. Retrieved 2009-05-05. ↑ "Staticmaster Ionizing Brushes". AMSTAT Industries. Retrieved 2009-05-05. ↑ "General domestic licenses for byproduct material". Retrieved 2009-05-05. ↑ Singleton, Don (2006-11-28). "The Availability of polonium-210". Retrieved 2006-11-29. ↑ "Radioactive Isotopes". United Nuclear. Retrieved 2007-03-19. ↑ "Safety data for hydrogen cyanide". Physical & Theoretical Chemistry Lab, Oxford University. ↑ Momoshima, N.; Song, L.X. ; Osaki, S.; Maeda, Y. (2001). "Formation and emission of volatile polonium compound by microbial activity and polonium methylation with methylcobalamin". Environ Sci Technol. 35 (15): 2956–2960. doi:10.1021/es001730. ↑ Momoshima, N.; Song, L.X. ; Osaki, S.; Maeda, Y. (2002). "Biologically induced Po emission from fresh water". J Environ Radioact. 63 (2): 187–197. doi:10.1016/S0265-931X(02)00028-0. PMID 12363270. ↑ Li, Chunsheng; Sadi, Baki; Wyatt, Heather; Bugden, Michelle; et al. (2010). "Metabolism of 210Po in rats: volatile 210Po in excreta". Radiation Protection Dosimetry. Oxford University Press. 140 (2): 158–162. doi:10.1093/rpd/ncq047. PMID 20159915. Retrieved 2013-04-09. 1 2 "Health Impacts from Acute Radiation Exposure" (PDF). Pacific Northwest National Laboratory. Retrieved 2009-05-05. ↑ "Nuclide Safety Data Sheet: Polonium–210" (PDF). hpschapters.org. Retrieved 2009-05-05. ↑ Naimark, D.H. (1949-01-04). "Effective half-life of polonium in the human". Technical Report MLM-272/XAB, Mound Lab., Miamisburg, OH. OSTI 7162390. ↑ "Polonium Poisoning". Retrieved 2009-05-05. ↑ Health Risks of Radon and Other Internally Deposited Alpha-Emitters: BEIR IV. National Academy Press. 1988. p. 5. ISBN 0-309-03789-1. ↑ Health Effects Of Exposure To Indoor Radon. Washington: National Academy Press. 1999. Archived from the original on 2006-09-19. ↑ "The Straight Dope: Does smoking organically grown tobacco lower the chance of lung cancer?". Retrieved 2009-05-05. ↑ "Nuclear Regulatory Commission limits for 210Po". U.S. NRC. 2008-12-12. Retrieved 2009-01-12. ↑ "PilgrimWatch – Pilgrim Nuclear – Health Impact". Retrieved 2009-05-05. ↑ Zimmerman, Peter D. (2006-12-19). "The Smoky Bomb Threat". The New York Times. Retrieved 2006-12-19. ↑ "American nuclear guinea pigs : three decades of radiation experiments on U.S. citizens". Retrieved 2015-06-09. ↑ Manier, Jeremy (2006-12-04). "Innocent chemical a killer". The Daily Telegraph (Australia). Archived from the original on January 6, 2009. Retrieved 2009-05-05. ↑ Karpin, Michael (2006). The bomb in the basement: How Israel went nuclear and what that means for the world. Simon and Schuster. ISBN 0-7432-6594-7. ↑ Maugh, Thomas; Karen Kaplan (2007-01-01). "A restless killer radiates intrigue". Los Angeles Times. Retrieved 2008-09-17. ↑ Watson, Roland (2006-12-03). "Focus: Cracking the code of the nuclear assassin". The Sunday Times. London. Archived from the original on 2008-02-10. Retrieved 2010-05-22. ↑ Bart, Katharina (2012-07-03). Swiss institute finds polonium in Arafat's effects. Reuters. ↑ "Experts exhume Arafat, seek evidence of poison". Reuters. 2012-11-27. Retrieved 2012-11-27. ↑ Froidevaux, P.; Baechler, S. B.; Bailat, C. J.; Castella, V.; Augsburger, M.; Michaud, K.; Mangin, P.; Bochud, F. O. O. (2013). "Improving forensic investigation for polonium poisoning". The Lancet. 382 (9900): 1308. doi:10.1016/S0140-6736(13)61834-6. 1 2 Isachenkov, Vadim (2013-12-27) Russia: Arafat's death not caused by radiation. Associated Press. ↑ "Guidance for Industry. Internal Radioactive Contamination — Development of Decorporation Agents" (PDF). US Food and Drug Administration. Retrieved 2009-07-07. ↑ Rencováa J.; Svoboda V.; Holuša R.; Volf V.; et al. (1997). "Reduction of subacute lethal radiotoxicity of polonium-210 in rats by chelating agents". International Journal of Radiation Biology. 72 (3): 247. doi:10.1080/095530097143338. ↑ Baselt, R. Disposition of Toxic Drugs and Chemicals in Man, 10th edition, Biomedical Publications, Seal Beach, CA. ↑ Hill, C. R. (1960). "Lead-210 and Polonium-210 in Grass". Nature. 187 (4733): 211–212. Bibcode:1960Natur.187..211H. doi:10.1038/187211a0. ↑ Hill, C.R. (1963). "Natural occurrence of unsupported radium-F (Po-210) in tissue". Health Physics. 9: 952–953. PMID 14061910. ↑ Heyraud, M.; Cherry, R. D. (1979). "Polonium-210 and lead-210 in marine food chains". Marine Biology. 52 (3): 227–236. doi:10.1007/BF00398136. ↑ Lacassagne, A. & Lattes, J. (1924) Bulletin d'Histologie Appliquée à la Physiologie et à la Pathologie, 1, 279. ↑ Vasken Aposhian, H.; Bruce, D. C. (1991). "Binding of Polonium-210 to Liver Metallothionein". Radiation Research. 126 (3): 379–382. doi:10.2307/3577929. JSTOR 3577929. PMID 2034794. ↑ Hill, CR (1965). "Polonium-210 in man". Nature. 208 (5009): 423–8. Bibcode:1965Natur.208..423H. doi:10.1038/208423a0. PMID 5867584. ↑ Hill, C. R. (1966). "Polonium-210 Content of Human Tissues in Relation to Dietary Habit". Science. 152 (3726): 1261–2. Bibcode:1966Sci...152.1261H. doi:10.1126/science.152.3726.1261. PMID 5949242. ↑ Martell, E. A. (1974). "Radioactivity of tobacco trichomes and insoluble cigarette smoke particles". Nature. 249 (5454): 214–217. Bibcode:1974Natur.249..215M. doi:10.1038/249215a0. Retrieved 20 July 2014. ↑ Martell, E. A. (1975). "Tobacco Radioactivity and Cancer in Smokers: Alpha interactions with chromosomes of cells surrounding insoluble radioactive smoke particles may cause cancer and contribute to early atherosclerosis development in cigarette smokers". American Scientist. 63 (4): 404–412. Bibcode:1975AmSci..63..404M. JSTOR 27845575. PMID 1137236. ↑ Tidd, M. J (2008). "The big idea: polonium, radon and cigarettes". Journal of the Royal Society of Medicine. 101 (3): 156–7. doi:10.1258/jrsm.2007.070021. PMC 2270238 . PMID 18344474. ↑ Radford EP Jr; Hunt VR (1964). "Polonium 210: a volatile radioelement in cigarettes". Science. 143 (3603): 247–9. Bibcode:1964Sci...143..247R. doi:10.1126/science.143.3603.247. PMID 14078362. ↑ Kelley TF (1965). "Polonium 210 content of mainstream cigarette smoke". Science. 149 (3683): 537–538. Bibcode:1965Sci...149..537K. doi:10.1126/science.149.3683.537. PMID 14325152. ↑ Ota, Tomoko; Sanada, Tetsuya; Kashiwara, Yoko; Morimoto, Takao; et al. (2009). "Evaluation for Committed Effective Dose Due to Dietary Foods by the Intake for Japanese Adults". Japanese Journal of Health Physics. 44: 80–88. doi:10.5453/jhps.44.80. ↑ Smith-Briggs, JL; Bradley, EJ (1984). "Measurement of natural radionuclides in U.K. diet". Science of the Total Environment. 35 (3): 431–40. doi:10.1016/0048-9697(84)90015-9. PMID 6729447.